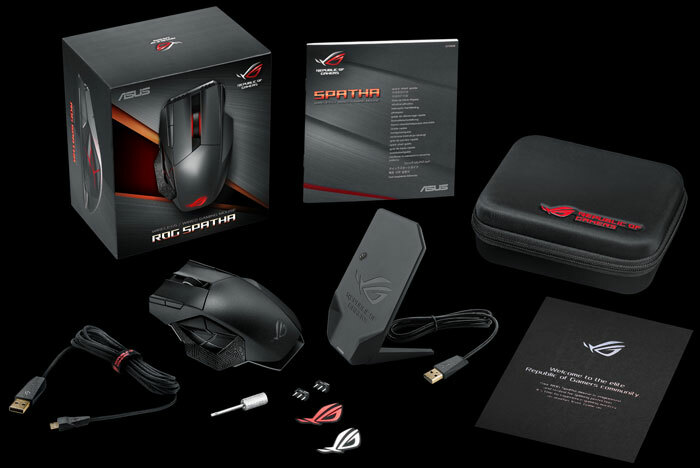 ASUS Republic of Gamers has announced a new gaming mouse. Referred to, as usual, as a 'weapon', the ROG Spatha features a striking angular design, magnesium alloy chassis, and RGB lighting across three independent zones. You will also observe that the ASUS ROG signature Mayan patterns have been employed on the mouse grip areas. At the heart of any mouse is the sensor. 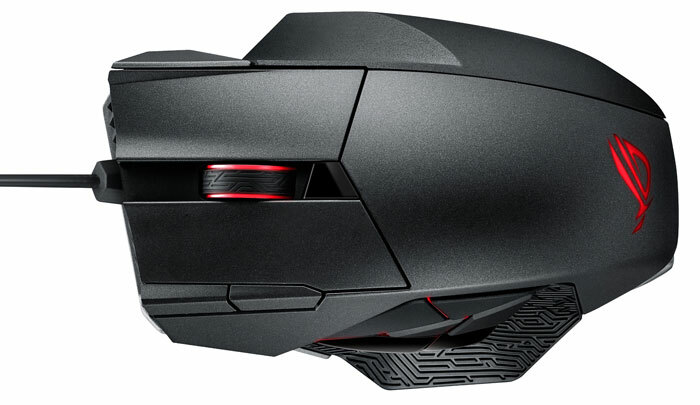 ASUS ROG has equipped an 8200DPI laser sensor in this mouse. This sensor can track up to 30g acceleration and 1,500 inches per second. A customisable two level dpi switch with LED indicator is present just above the scroll wheel. The ASUS ROG Spatha has 12 buttons which are programmable and great for MMO gaming, says ASUS. On the left side of the body there is an array of 6 thumb buttons. All six of these button feature ALPS switches with tactile feedback and are arranged in a ROG Eye shape. The two main left-right buttons feature Omron switches with a 20 million click lifespan. Should you wish, or need to do so, it is possible to swap the main buttons thanks to an easy-swap socket design. Between the left and right buttons resides an ALPS encoder scroll wheel for smooth and accurate movement. ASUS ROG has equipped the Spatha with flexible connectivity. Buyers are provided with a choice of two connector cables, or the option to go wireless. Both a braided 2m cable and a 1m rubber cable are supplied in the box. Using a wired USB connection the mouse offers a polling rate of up to 2,000Hz. Wireless mode polling rate tops out at 1,000Hz. When in wireless mode, users can check that the rechargeable battery if up to snuff via a dedicated LED indicator. A charging dock is supplied. As mentioned in the intro paragraph, the ROG Spatha has three independent RGB lighting zones. These cover the scroll wheel, ROG logo and side buttons area. Six colour lighting effect presents are provided and you can fiddle further with lighting, keys, macros, profiles and so on in the ASUS ROG Armoury dashboard control panel software. The ASUS ROG Spatha is the proud winner of a 2016 reddot design award. This mouse was first shown at CES so this recent press release probably indicates impending availability. However we don't have any firm pricing or availability information at the time of writing. Package contents: 1 x wireless receiver/ charging dock, 1 x 2-meter braided USB cable, 1 x 1-meter regular rubber USB cable, 2 x Japanese-made Omron switches, 1 x ROG hard carry case, 2 x ROG logo stickers, 1 x screwdriver, User documentation. Still don't know why mouse makers mostly ignore the fact that I have three almost completely unused fingers, still… so many more possible buttons (especially for the MMO fans) that would make this a proper awesome mouse. The ASUS ROG Spatha has 12 buttons which are programmable and great for MMO gaming, says ASUS. Up and Down scroll are not buttons so do not count, says Tasky. All six of these button feature ALPS switches with tactile feedback and are arranged in a ROG Eye shape. Don't be silly. See the switches and screw driver? You have to make the chassis yourself!